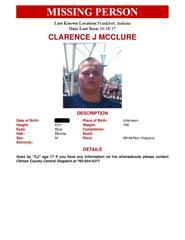 Clinton County Central Dispatch and Frankfort Police are trying to locate a missing juvenile. C.J. McClure, 17, was last seen on Wednesday, Oct. 18. If you have any information, call Central Dispatch at 654-4277.